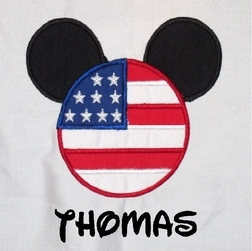 Home > DISNEY Minnie Mouse and Mickey Mouse Clothing > BOYS > MICKEY MOUSE HOLIDAY OUTFITS > Boy's Mickey Mouse Custom 4th of July, Flag Outfit. Boy's Mickey Mouse Custom 4th of July, Flag Outfit. This is our 4th of July patriotic Disney Mickey Mouse outfit. 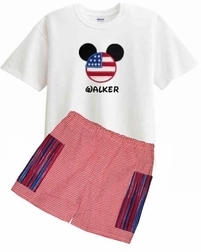 We start with a white short sleeve shirt and applique it with Mickey Mouse's head made to look like the American Flag, complete with the blue with white stars and the red and white stripes. 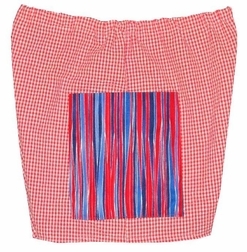 The shirt can be paired with red seersucker gingham shorts made with big, side cargo style pockets made using a patriotic stripes fabric. Increase the cuteness by monogramming it under Mickey's head.